We just put in our newest bunch of pigs today. Is there any interest in thread, showing them growing to market weight, and answering questions as we go?? I'll try to update pictures a couple of times per week. Here they are shortly after arrival this morning, my friend was early and I hadn't gotten the pen bedded yet. This was tonight about midnight. 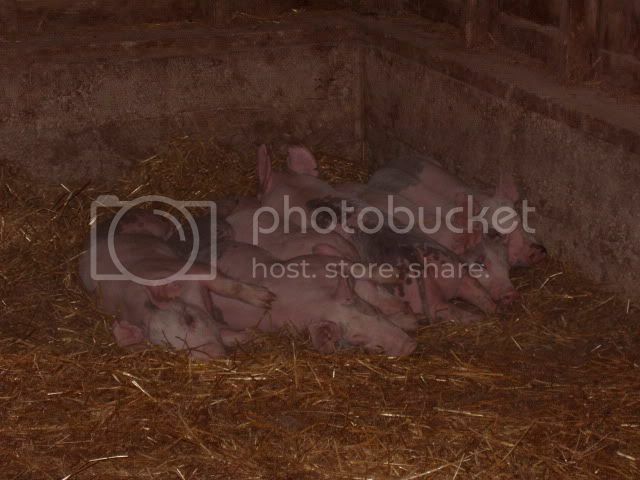 They snuggled into the straw for their first night in the new surroundings. Just for scale, the cement foundation behind them is about 18 inches tall. The pigs weigh about 50 lbs. They will be here for about the next 3 1/2 months until they hit market weight of 265- 275 lbs. Let me know if you want me to keep posting pics. If there is no interest, I'll save the effort for other things. Last edited by Freezer Pig on May 24th, 2012, 11:08 am, edited 1 time in total. Yes, please post pics and descriptions. Will they have names? OK, I'll try to post a new picture(s) at least once a week, so you can see them grow. 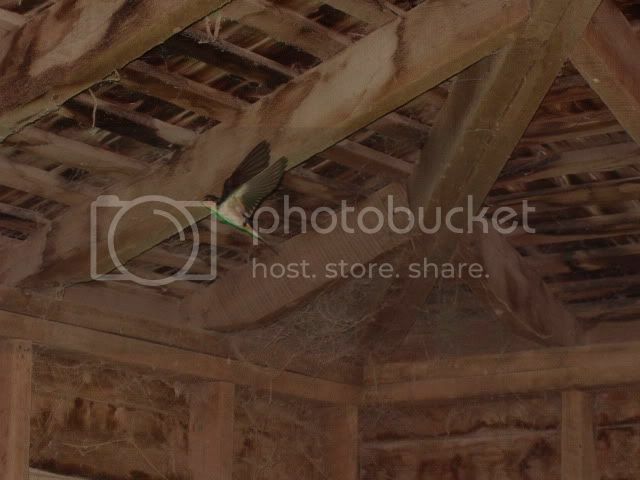 I'll include pictures of barns and equipment as we go along. If there are any questions, I'll do my best to answer them as clearly as possible. As far as names, we don't exactly name them. There are usually a couple in each group that stand out from the crowd, so they'll get a name attached. In the last bunch, one of them had dark spots above each eye, he was dubbed Groucho early on and it stuck, but it's not like they come when we call them or anything. Right now they are still kind of skittish when we walk in the barn. It usually takes about a week for them to just keep going about their business, when we walk in to check on them. Eventually, they will come to the fence to get an ear or back scratched. What are they being fed? Are they an unusual breed? What makes them special? they are pretty cute for pigs. I think many would love to follow along to see how they grow. I'm interested in updates too. OK, since I spent pretty much the whole day planting the garden, I'm taking a short break from sleeping to pop a couple of Aleve. I'll answer some questions before I head back to bed. mhill95149 wrote: What are they being fed? They are fed a mixture of corn, soybean meal and commercial supplement, ground and mixed into a texture almost like corn meal. The ration is balanced for the protein level the pigs need for optimum growth. The soybean meal raises the protein level higer than the corn can provide on it's own. The supplement also has a bit of protein and it also carries the additional vitamins & minerals the pigs need, that they can't get from a straight grain mix. The pigs have free access to this feed 24/7. They are odd amongst livestock, in that they will only eat what they need, but won't over eat. They also get vegatable and fruit scraps, from our everyday cooking (mostly peelings and such), it doesn't add much to their overall growth but it gives them something different to eat and they enjoy it. mhill95149 wrote: Are they an unusual breed? What makes them special? Nothing special about these pigs. I get them from a lifelong friend who is one of the last small independent hog producers in our area. They have about 100 sows (mother hogs), and these pigs are the same as the ones he raises for market, going to a commercial packer. They are Yorkshire x Hampshire cross. 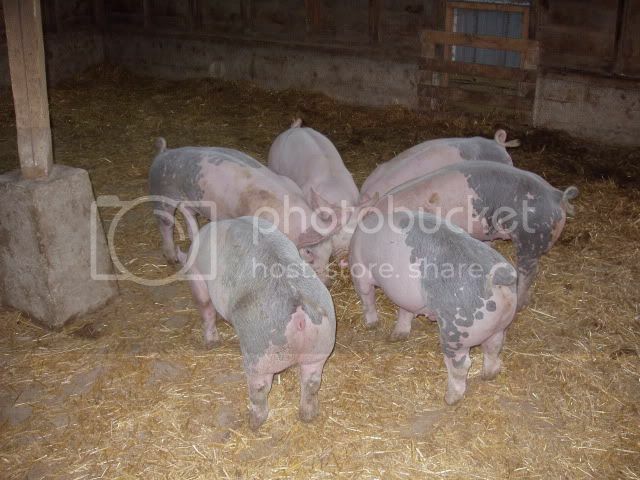 They are known as Blue Butts in the hog farming world because they often have that blueish freckled hind quarter. Yorkshires are a breed known for their mothering ability and Hampshires are known for their growth and carcass traits for market hogs. My friend keeps Yorkshire as his sow herd and breeds them to Hamshire boars (Males) for what is known as a terminal cross, this means all the offspring from the mating will be for market, none will be kept for breeding. Yorks are completley white and hamps are black with white front legs/shoulders. When you cross the two breeds, this is what the offspring look like. When I describe my friends operation, it is in ideal terms, in reality,I think he does keep a few crossbred females back for breeding, just for diversity. Anyhow, I hope this answers your questions in 1 million words or less, if it didn't, ask again. I'm trying to strike a balance between being too technical and too general. It feels like my drugs have kicked in, time for a couple more hours of sleep. Yes. 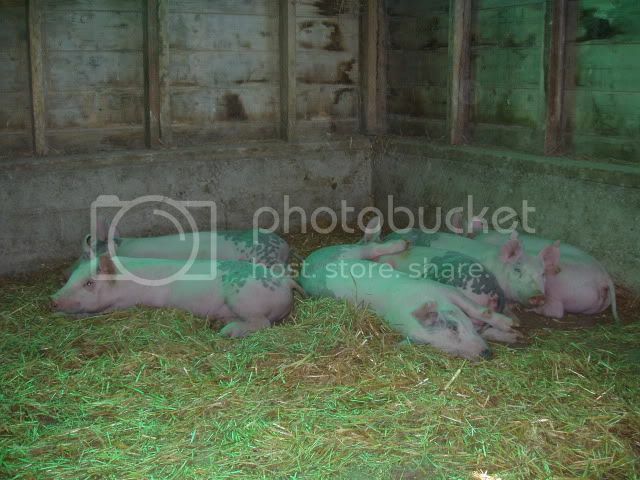 They are so cute & all of those little piggies will go to market. 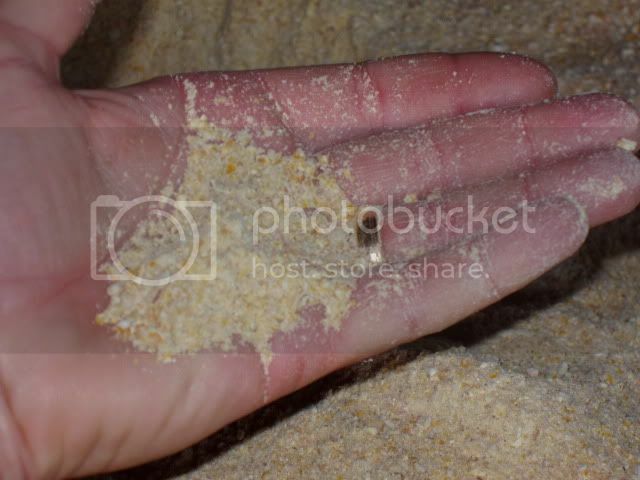 Here's a quick picture of what the pigs are eating...... the corn meal looking stuff, not the hand. One week update. 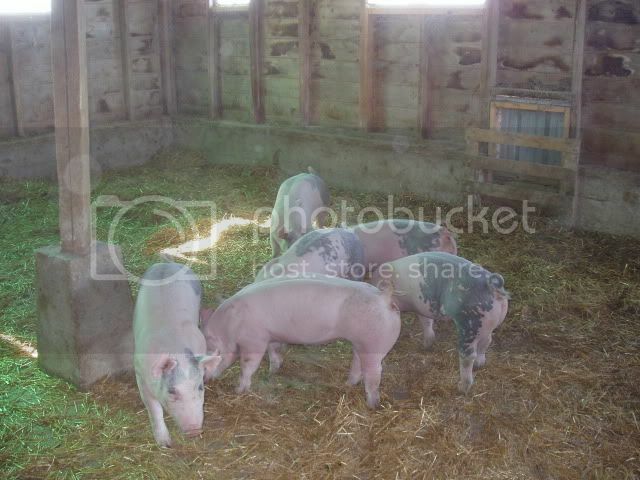 The porkers are starting to get comfortable around us, they don't jump up and run every time we walk in the barn now. This morning when I checked them, they wouldn't even get up to move around. That's OK, I can tell they are OK by the way they are laying, they'll be up later. Not alot of growth yet, the first week is usually spent just getting used to the new place. They'll start to take off better next week. I took shots of a couple of other barn inhabitants this morning. Fisrt picture is a sign that Spring is officially here. 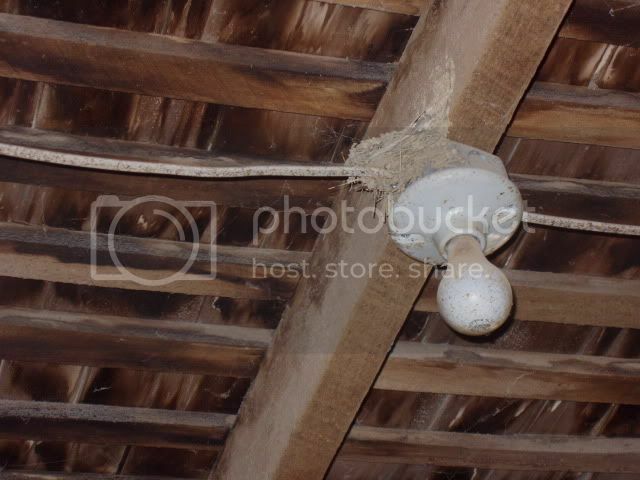 We've had a pair of Barn Swallows use the same nest, every year, since they built it three or four years ago. This year, there is a second pair flitting around out there, so I assume there will be another nest being constructed soon. The original nest must have eggs in it because they seem to be especially intolerant of me this morning. We like having them around since pigs and flies go hand in hand. The swallows have plenty to eat close to home. Next critter.......... Two years ago, we got a pair of twin male kittens from a friend of ours. They have the run of the place, except for the house. They keep the unwanted rodents at bay and come and go as they please. Last year, we had a new kitten show up. He was just big enough to be weaned and he was obviously tame, so somebody must have dumped him off. 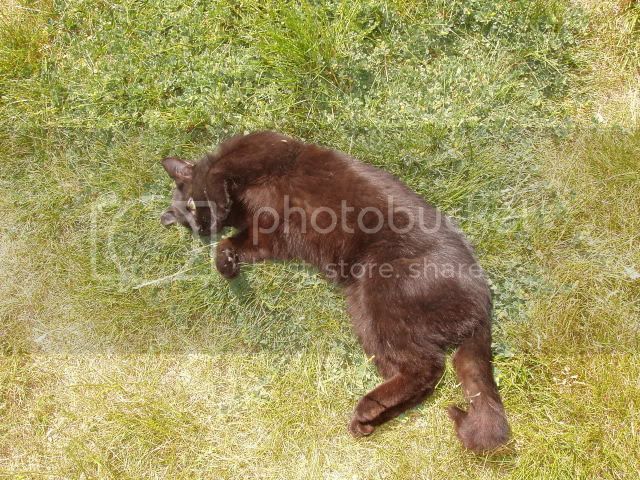 One of the older male cats adopted him and he's turned into a pretty good mouser too. Last winter, the newest cat adopted a friend. We would catch glimpses of her (not sure it's a her yet) from time to time, but never a good look. About a week ago, all of the sudden, the new cat started getting braver. My wife has been able to touch her a few times but she is far from being picked up yet, she is allowing us to come closer when she wants though. 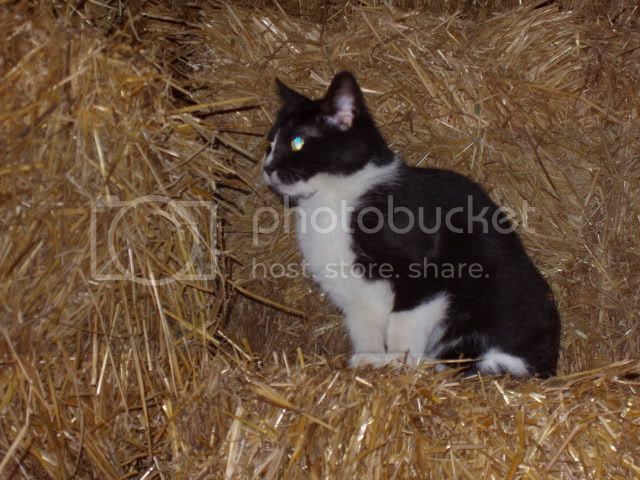 This morning, when I was in the mow throwing down straw, the new cat came out and watched me, so I took her picture. If it really is a female, she's going to the vet..... we don't need a litter kittens around here. I think 4 cats will be enough. Anyhow, that's the tour this morning. Please keep these updates coming and I hope you feel free to write about whatever you want to. Interesting stuff, FP! Thanks for posting it. 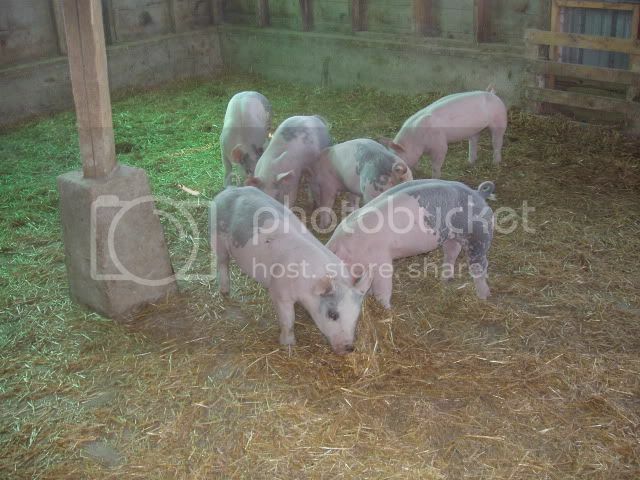 Are you going to pasture the piggies, or keep them in the barn? I'm interested in this story since for the last three years I've gone over to Ontario and picked up an eighth of a Large Black. Tasty! I know that Yorkshire is supposed to keep a bit of fat and taste, but I don't know anything about the Hampshire race. Pls keep those cards and letters coming! How cool. I am going to have my girls moniter this thread-please keep the pictures coming. 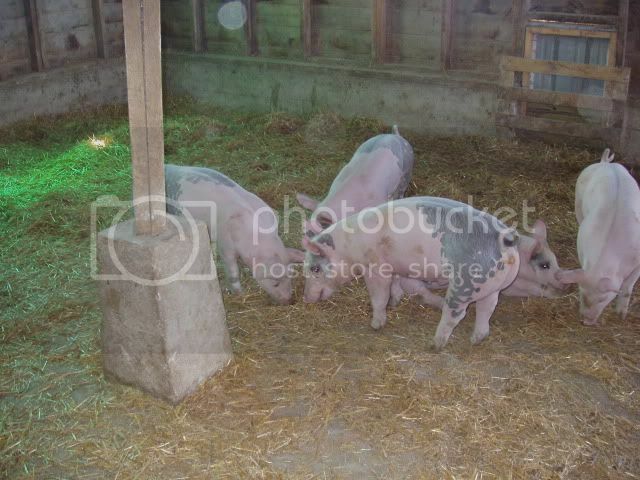 We keep our pigs in the barn. They have plenty of space and we clean the pen once a week, twice or more when they get bigger. They have straw to snuggle into and it's bright and airy. There are actually two pens there, but when we just have one group, we open it up so they have full run of the place. 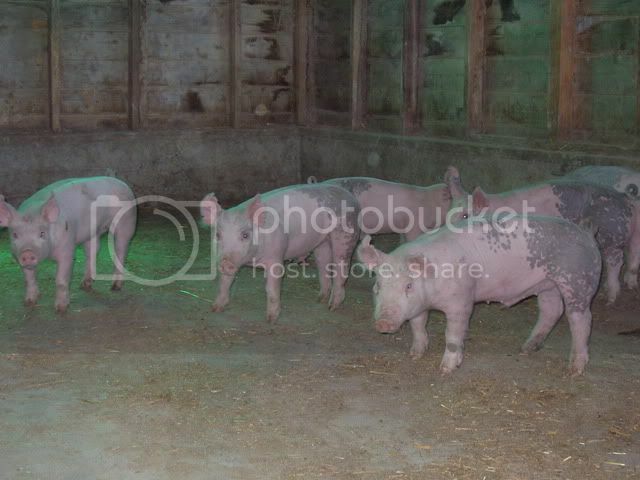 Pigs are pretty clean, once they decide where they are going to relieve themselves, they will keep it all in that spot. They won't soil where they sleep or eat, as long as the pens are kept clean. So that's the way we do it, I have nothing against pastured pigs, it's just not for us. Elfin wrote: How cool. I am going to have my girls moniter this thread-please keep the pictures coming. Thanks Elfin, I was hoping that would be the response to this thread. I just want to remind everyone, these pigs are going to market around the beginning of September..... don't get too attached. I'll try to keep adding this disclaimer from time to time. OK, early update this week. We have a few functions this weekend, so this might be my only chance to get pic's added. I'll try to check in and answer questions when/as I can. Pig update...... they are getting comfortable with us and their surroundings. They run to us instead of away, when we crawl in the pen now, so it's hard to get a picture. I think this will be the new perspective, I'll try to get this angle every time, so you can compare growth. They are doing well, they've gained about 10-15 pounds since they've been here. Feed consumption is up to where it should be now and it looks like they are off to a good start. It's always nice to get them through the first couple of weeks without a hitch. I don't know if the weather is going to change or what, but they were all wound up this morning. They were playing and chasing each other around the pen, barking and woofing, another sign they are off to a good start. Other critter for the week. This is Krazy Kat, we brought him and his twin brother home two years ago (Memorial Day weekend as a matter of fact). We had been without cats for years and decided a couple of males wouldn't get in too much trouble. He looks fat in the picture but he's not, he's 12 pounds of muscle and bone. Him and his brother are very rarely here at the same time anymore, one is always out hunting while the other is guarding the pigs. Last pic of the week. This is the field across the road from our house. The corn is about a foot tall and off to a very good start. It could use a drink, but it's not too stressed yet. 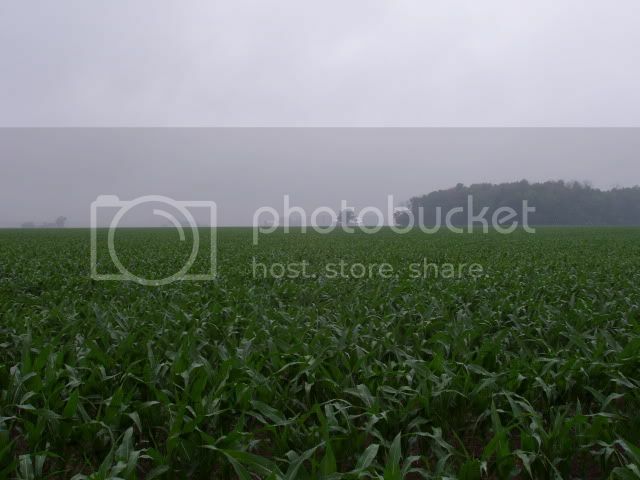 Last year, alot of the corn in this area was just getting planted Memorial Day weekend. This field has been in the ground since right after Easter. I'll post a new picture of the corn growing, along with the pigs, for anybody following along who doesn't get to have a rural view every day. Hope everybody has a safe and enjoyable Memorial Day. I love this thread. Thanks Tim! Where will the pigs eventually be sold? Maybe consider changing the name of the thread to be more descriptive of the topic since there is obviously plenty of interest!! boudreaulicious wrote: Maybe consider changing the name of the thread to be more descriptive of the topic since there is obviously plenty of interest!! Great thread. Temporary moderator edit to title; Freezer, if you'd like to change it, hit "edit" in your original post. Thanks for the assist Santander, the title is updated. I was thinking last night I should have asked permission before I started this, and sucked up all the bandwidth on a single thread. Thanks for the nod. 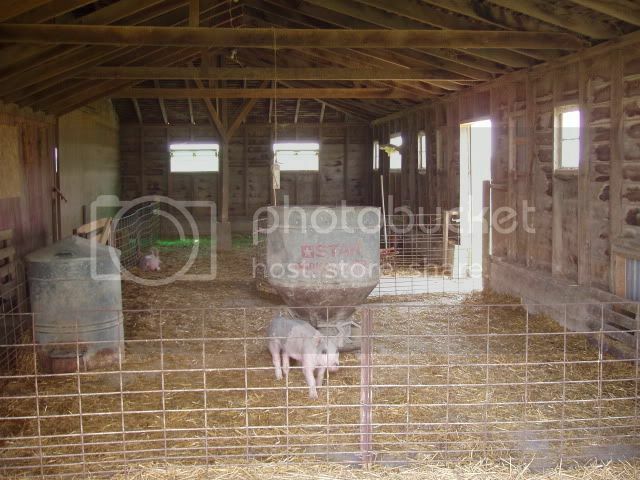 pacent wrote: Where will the pigs eventually be sold? We usually have most of them spoken for before we put them in. We always add one or two extra, in the group, for anybody who calls in the meantime looking for a half. If we get stuck with one we can't get rid of, we'll just make it into whole hog sausage and sell it from home. The calls came in the next day for the extra pig in this bunch, I wished we had a couple more now. Usually, late summer is the hardest time of year to find buyers, so we held back, not the case this time. Time for a picture laden three week update. The pigs are eating and growing well. The picture doesn't show it much, but they are getting bigger. They run to the fence everytime we walk in now. We are still without rain. 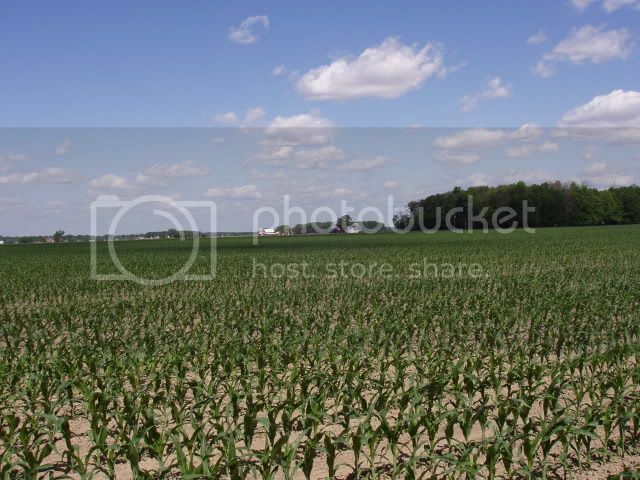 The corn is still growing, but it's showing signs of needing water. Looks like tomorrow night we are supposed to get some nice rains, it won't be a minute too soon. 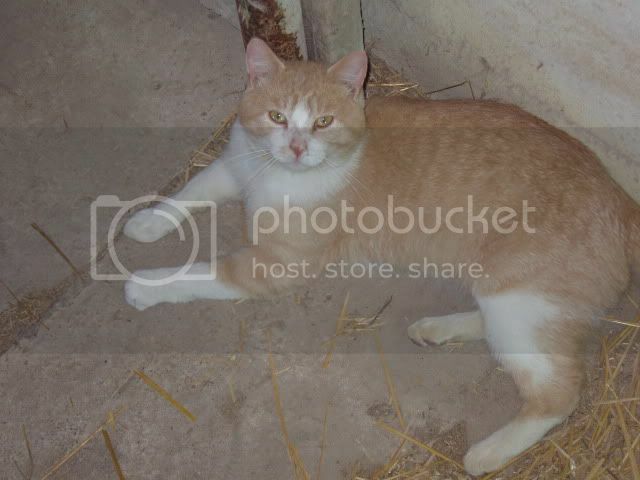 Last years stray cat was playing outside the barn door this morning, so he got his picture taken. This is Kramer. Somebody dumped him last summer, when he was just old enough to be weaned. He found his way into our barn and has called it home ever since. This year, he adopted the black and white cat I had a picture of a couple weeks ago. We have enough cats now, the population needs to stabilize. Last pic o' the week. This was taken about 2 hours ago, right after they arrived. 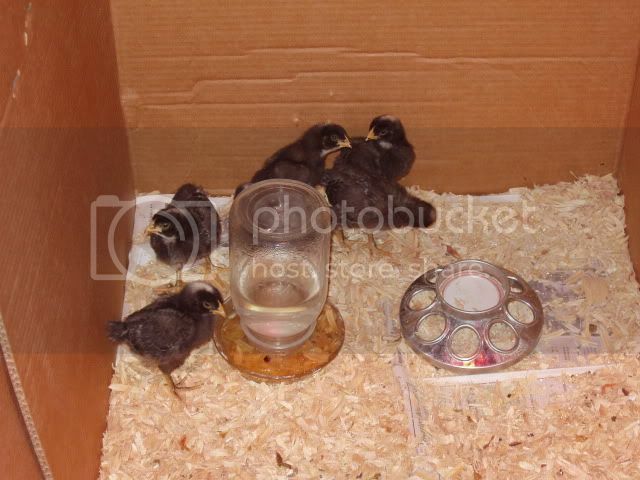 These are Barred Rock pullets. They are probably less than 48 hrs old. Our old layers will be 2 1/2 years old when these start laying, it'll be time for some increased production by then. As of right now, they've all had a good drink and something to eat, so they are hopefully off to a good start. We'll have to keep a pretty close eye on them for the first couple of weeks though. I guess that's it. This started out to be a pig growing thread, and it's kind of gotten out of hand. Hope everybody likes looking at pictures. Freezer Pig, Thanks for posting these pictures! 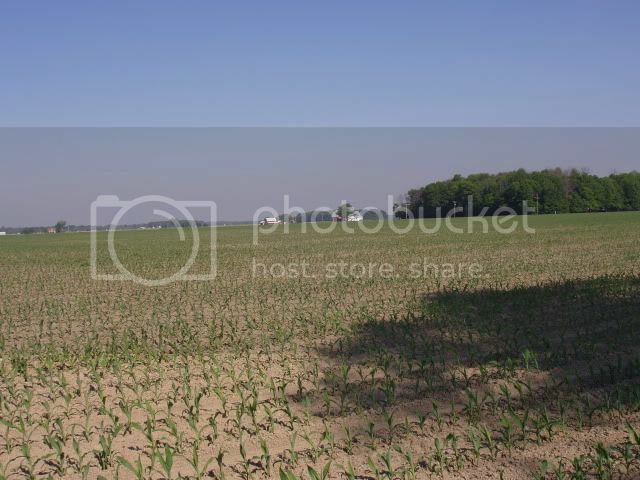 Corn fields are pretty distressed here too about 45 miles west of Chicago. Our recent 90 degree days and no rain hasn't helped. Tim, Thanks so much for the photos! 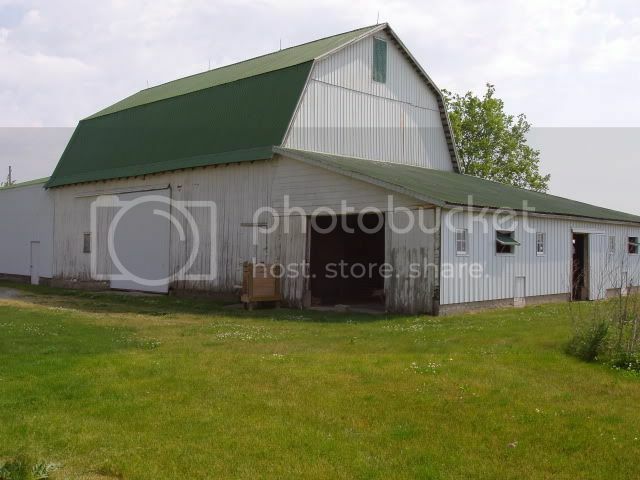 I grew up in central Ohio -- not on a farm, but in a small enough city that I could and did regularly drive through the countryside and see farms on a regular basis. Your photos are making me a bit homesick! 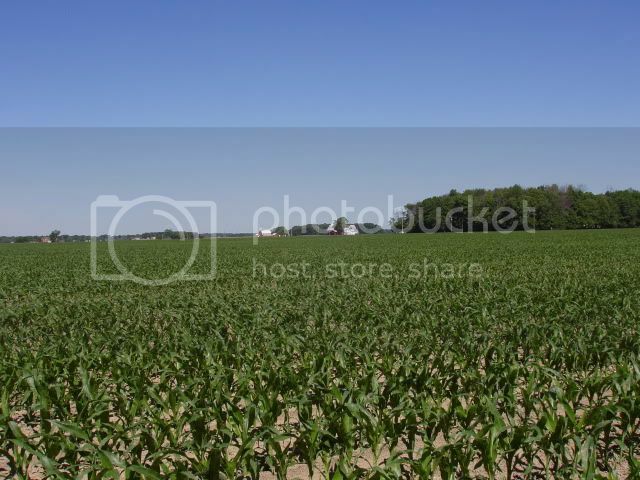 Especially the growing corn, I love being able to compare the photos as it grows. Please keep it coming, and thanks. Time for an update from NW Ohio. The pigs are growing well, the hot temps of last week have turned milder and the pigs are more comfortable. They are pushing 90 lbs now, on their way to 275. We are still badly in need of rain. Last Thursdays promise of an inch, split halfway across Indiana and went north and south of us. We ended up with 1/10". Looks like nothing substanial is in sight. The corn would be waist high by now if it had gotten a couple shots of moisture, as it is, it's stuggling to even close the rows. The new chicks are growing fast. 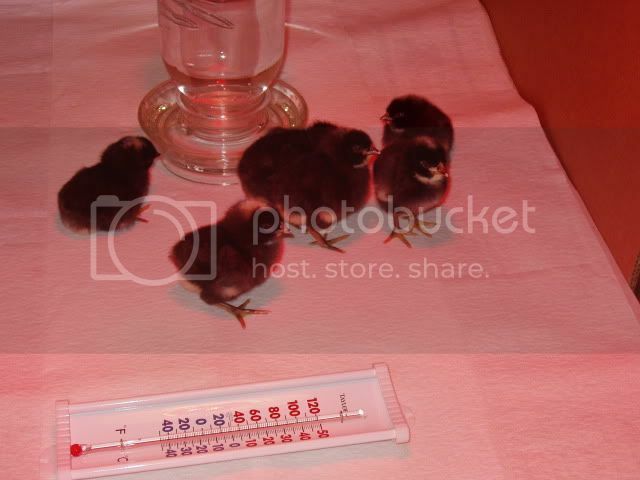 The temperature swings from day to night are making it hard to regulate their temperature under the heat lamp. We are having to raise and lower the lamp many times a day to try to keep an even 95 degrees during the first week. As they get bigger, it's less critical, but the first few days was pretty frustrating trying to regulate things. They are just starting to get pin feathers on their wing tips, they'll be "flying" to the top of the waterer and across the box in another week. Last shot of the week, A few posts back I mentioned there was a second pair of swallows checking out the barn. Looks like they've started their nest. I'm guessing it'll take a while since mud is pretty scarce right now. It won't be long before we have two nests full of little swallows learning to fly. That's it, thanks for looking. Tnx Tim, I just *love* your reports. 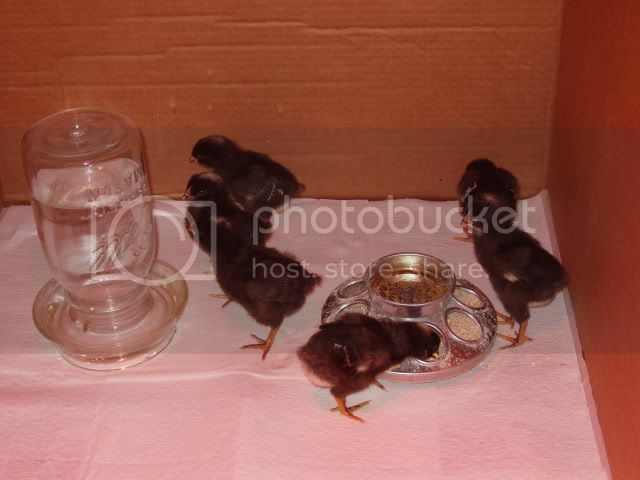 Hmmmm, seems to me that it would be easy enough to fashion a thermostat for the chicken 'spa', using a simple household thermostat, that would regulate the heat lamp. I've jury-rigged such a device in my grapevine 'incubating' bed; worked pretty well, too. I've thought about using a thermostat but we only do this once every couple of years. I'm also not fond of mixing electricity and animals, even little ones. We check the chicks almost constantly during the first week, so we can make the adjustments if we have to, it's just nice when it stays steady. Since I'm posting a reply, I'll add a picture (sorry, kinda blurry). 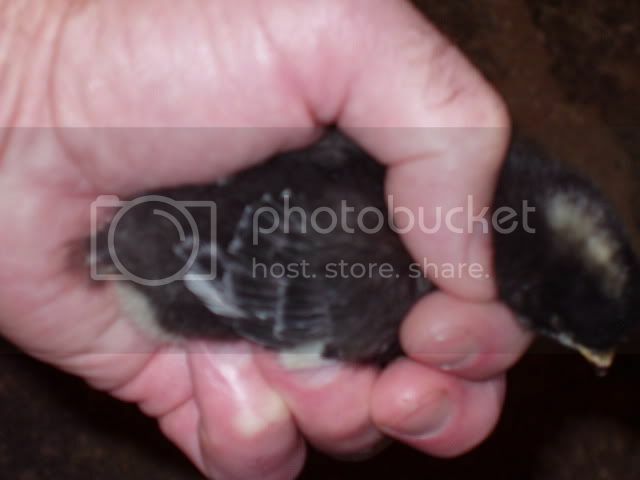 The chicks are a week old and they are getting quite a few pin feathers already. They are starting to use their wings to help propel themselves too, they are getting harder to catch. Tim, many thanks for posting this. Well, it's been about a week, so I guess it's time for updated pic's. The pigs are growing and eating as they should be. Right now we are just watching them grow and making sure they have all they want to eat and drink. 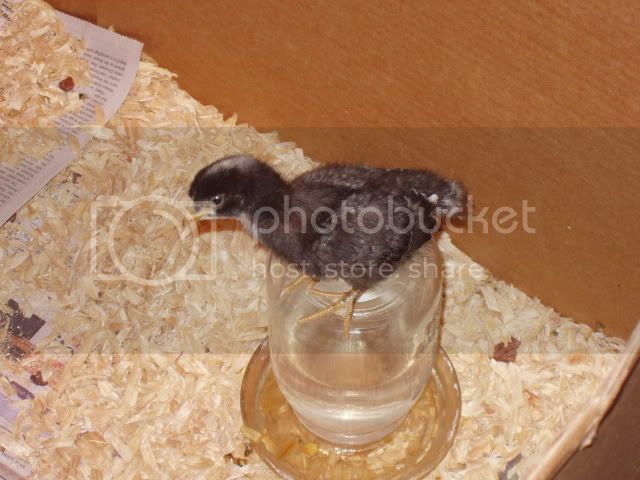 The new chicks are growing too. One has learned to fly/jump to a higher perch for a better look around. I'll finish with the new arrivals of the week. 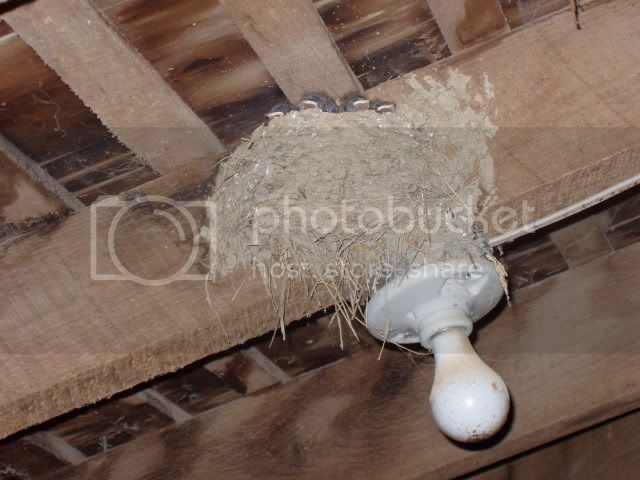 The old nest of Barn Swallows has produced another crop of bug eaters. That's all for today, I'm going outside to work on my rain dance. Take good care of those swallows--aerial insectivore populations are crashing badly. Hope you get lots of rain!